Video marketing is a way to get connected to wider audience. The brands and the businesses will get the opportunity to tell story in a better way. Startups may not be able to invest lot of money for creating professional videos but they can use the dollars effectively by creating great videos to market the startup. 1. There is no need to hire professional for creating video content. See that the content is exclusive. 2. Creating how to videos is an effective strategy for the startups. 3. Try educating the customers about the product and the industry through the videos. 4. Startups must try to provide their audience with compelling content. 5. They should use the multimedia marketing approach to extend the reach. 6. The objective of video marketing strategy should not be selling alone. 8. Know the target audience. 9. Understand what type of content the audience will like and share. 10. Try to create content that the audience wants to and will appreciate. 11. Also, try to find out the format and topic that will help connect with the audience best. 12. Try to create videos on topics that are related to your brand. 13. Le the message be clear and concise. Keep it a simple. 14. Always remember to include a call to action. 15. However good the content of the video marketing is it should be interesting to the target audience. 16. The content of the video must engage and provide information to the videos and speak for the brand. 17. Viewers’ attention spans are shorter online and so let the video be short. 18. Do not neglect SEO. 19. Optimize the video content with powerful keywords in the description. 20. Do not neglect to add tags. 21. Let the title of the video has the main keyword. 22. Add the website link, social media link etc in the video description. 23. Post the links to the marketing video on all social networks. 24. Since startups are on tight budget, they should ask some questions themselves before creating videos. 25. These questions include who are potential customers are, what is the goal of the video etc. 26. Let the video have a great story. 27. It is not necessary to hire professional and startups with a tight budget can utilize the freelance platforms such as Up work. 28. Free video editing services are also available online. 29. Develop a story for the video. 30. Keep the video informative and of course short. 32. In each of the videos, add a call to actions and direct the audience to take some action such as subscribing to the channel, checking the landing page etc. 33. Share the marketing videos on as many platforms as you can. 34. Decide to which platform you want to post the videos, some of the platforms that bring more viewers are YouTube, Facebook, Instagram or Twitter. 35. Using popular platforms such as Facebook or Google helps to control who will watch the videos. 36. It is also possible to get the insights on customer behavior. 37. Analyze the results of the campaign. 38. The performance reports will help understand the customers and make necessary changes to the campaign. 39. 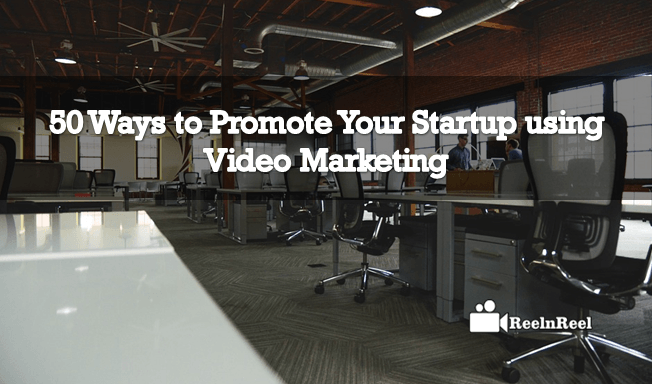 Startups can use their marketing videos to add to their newsletters to increase open rates and click through rates. 40. Do not forget to add share button at the bottom of the video. 41. Use the Pinned Tweet feature of Twitter and pin the videos to the Twitter page. 42. Let the marketing video has the most creative thumbnail. 43. Give the link of your video in the comments or responses. 44. Try marketing to the people that have already known you to be more effective. 45. Create the email list of customers who already bought from you and stay in touch with them. 46. Try releasing the videos at the right time. Some videos went viral just because they were released at the right time. 47. Conduct market research to determine want the audience like. 48. Quick recipe videos are the most popular format of video marketing. 49. Some other advanced formats are short films, music videos and animated films. 50. Post the videos on social networks and ask the friends to share them. Videos are the most popular form of content. It is the quicken way to connect with the prospective customers, viewers and followers. However, video marketing strategy establishment can be intimidating for startup. An online viral video will only need a small investment of time and money from the startups.